The market pulled back ~21 points today however continued to outperform overseas leads + we saw US Futures down during our time zone. The theme we discussed this morning around “Short SPI Futures / Long S&P spread trade” which seems to be unwinding was obvious again with weakness in US Futures not having the typical negative influence on our market. That could well be a transient thematic however the aggressive about turn by the RBA this week could clearly be a factor. Today we saw the data that underpinned their change in stance with the RBA cutting official growth and inflation forecasts fairly significantly. In its quarterly update of forecasts, they cut expectations for growth in the year to June 2019 to 2.5% from 3.25% and in the following 12 months to 2.75% from 3.25%. They blame a fall in housing which will impact consumption. They also talk about lower Oil prices which are having a significant impact on inflation along with a range of other factors that have flowed into these forecasts - slowing momentum in China another contributing factor. 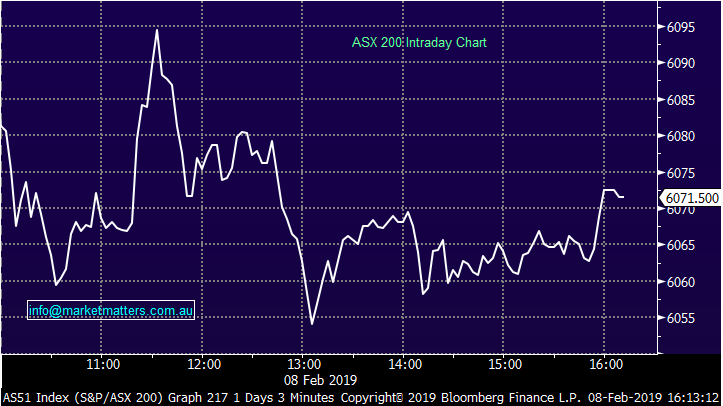 In short, I think it’s pretty clear the RBA has done a significant about turn and is now more likely to cut rates than increase them - the market has now priced in easing. The AUD dropped to 70.81c today, however while its down, I would have thought that such a harsh re-aligned of forecasts would have led a bigger decline – shows some underlying fortitude in the currency! 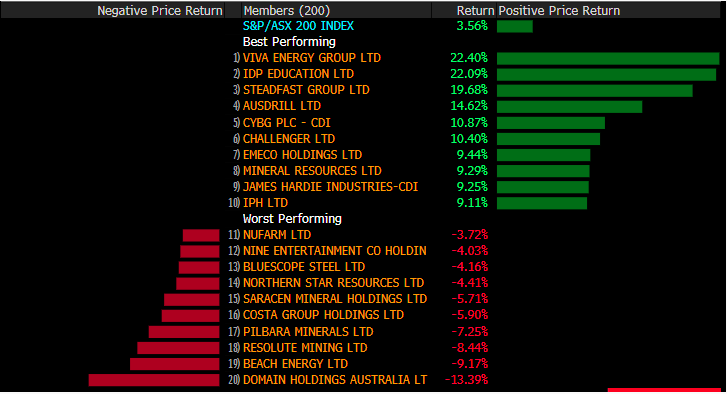 While the numbers above are clearly a concern for the health of the Aussie economy, markets / asset prices like lower rates, and combined with bank buying following the RC + Iron Ore prices that have ripped higher due to Vale’s issues, we’re clearly seeing a confluence of 3 very influential factors for our market. Overall today, the index closed off -21pts or -0.34% today to 6071 and was up an impressive 3.56% for the week. Dow Futures are trading down -110 points / -0.41%. I was also involved in two video updates, a quick update with Harry covering the rise in the market, the banks, the easing bias from the RBA and a few other bits and pieces. At the start of the year, the fundies with the top performing calls on Buy Hold Sell nominated their #1 stock picks for 2019. In today’s Buy Hold Sell, we ask our panellists for a second opinion on three of these stocks, which include a market darling tech stock, an overlooked gold junior that has just had an earnings upgrade and a fallen angel in the agricultural sector. We also ask our panellists for their own #1 pick for the year ahead. 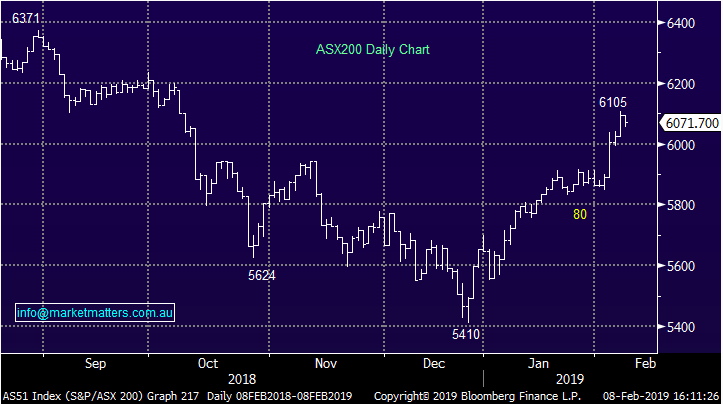 Joe Magyer from Lakehouse Capital explains why last year's ASX200 top performer could do it all over again, and James Gerrish from Shaw and Partners singles out another agri stock that could yield a bumper harvest this year. Tune in to hear five of the fundie’s favourites for 2019.